So you’ve made the decision: you’re going to spruce up your home in Dubai or the UAE with a new coat of paint. But then you may come to the realization with so many paint types out there, which one is right for your job? Of course, you can always hire a professional painter in Dubai and the UAE through mrUsta, but nonetheless, even if you do outsource the job, it’s best to come to the table knowing what you need and what you want. Latex paint is the paint of choice for painters in Dubai and the UAE for good reasons: it’s easy to apply and touch-up, easily cleaned off with water, it’s non-flammable, and dries quickly. However, it does contain its share of VOCs (volatile organic compounds), a known carcinogen. Good news is a lot of brands have worked hard to lower or completely eliminate VOCs in their paints. Alkyd paint, or oil based paint, is popular in applications that require a high gloss, durable finish, so you’ll find it popular amongst carpenters in Dubai and the UAE. They are the most suitable choice for furniture, cabinetry and trims. Alkyd paints are also easy to clean repeatedly without losing their color. However, alkyds take a relatively long time to dry- which has both its advantages and advantages. There are countless other types of paint; epoxy paint being popular too. You’re more likely to use this paint in garages and other spaces that take a lot of stress and wear-and-tear regularly. It’s also common in outdoor basketball courts. Consider what the room is being used for and whether its prone to scratches and bumps. Of course, no two rooms are alike. Alkyd paints are pretty resistant to scratches so consider this type of paint on the floors, doors, trims, and so forth. Paint is sensitive to air moisture. So whatever paint you choose – especially for your bathrooms – it has to own up to the humidity. As a rule of thumb, the ‘glossier’ the paint is, the more humidity-resistant it is. 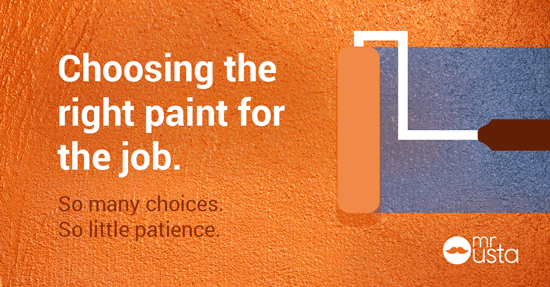 Speaking about glossiness, glossy paints last longer and don’t scratch as easy as matte paints. How glossy you want your paint to be is a matter of personal touch, but keep in mind the usefulness of this paint type. So what paint should you choose for your Dubai home? Latex paint is the best bet for most of your walls and household uses. However, oil-based paint is great for priming real wood moldings and trim as it tends to seal stains and knots from the wood better than latex paint. It does take longer to dry than a latex paint though, so take that into consideration when you are planning. What level of glossiness should your paint be? Ask yourself a question: how much time do you want to spend cleaning your walls? The glossier, or shinier, the paint, the easier it is to clean up. It would be common sense to use glossy paint in your child’s playroom, for example, as it’s virtually guaranteed that your walls would become an experimental art canvas. Your kitchen is another excellent candidate for gloss paints as it will be a lot easier to wipe off any grease while cooking. Do remember though that glossy paints tend to show bumps and scratches much more than non-glossy paints, so using it in your living room or other very public spaces may not be an option. And finally, what color should you choose for your Dubai home? Color, is of course, a personal choice – we’ve written a piece on how to choose your paint colors here. If you are opting for a move-out paint job, a requirement from most landlords in Dubai and the UAE, stick with a simple white and cheaper paints. No reason to indulge here. Now you have the basic knowledge to handle your own painting job, or negotiate better with a painter in Dubai and the UAE. And if you do opt for a helping hand to get your paint job done in Dubai and the UAE, use voucher code HELPMEPAINT50 to get AED 50 off your painting job with Mr Usta until 31 July. So that’s it! Get painting!